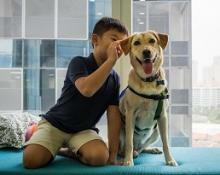 Having witnessed the power of the human-animal bond, Maureen Huang started Pawsibility that specializes in the use of Animal Assisted Therapy in conducting counselling and social emotional development programmes to help children and youth in Singapore overcome challenges and reach their full potential. Tell us how dogs help people with disabilities or conditions. Dogs change the atmosphere of a therapy setting. They help people to relax, be more engaged in the therapeutic process and be more motivated to participate in therapy. For example, a person with depression/anxiety may not even want to get out of bed to talk to their counsellor. The presence of a therapy dog changes that whole dynamic. The client feels motivated to come for the session and is generally more open to talking to their counsellor. In a way, the therapy dog helps to facilitate the interaction between therapist and client. In addition, patting a friendly therapy dog helps to lower one's blood pressure, heart rate, stress hormone-cortisol and increases social inducing hormone - oxytocin. For children with special needs, Animal Assisted Therapy (AAT) can be a great avenue for them to build healthy social emotional skills. These include kids on the autism spectrum who struggle with social skills and empathy. Working with a loving and non-judgemental dog helps these children to learn these skills in a fun way. The child learns how to make friends and be a friend, and grows to be more confident. On top of mental health work, therapy dogs can also aid in the rehabilitation of physical health. They can help in physiotherapy and occupational therapy, motivating patients to participate in therapy and encourage them to achieve more, for example increased mobility, strength, fine/gross motor skills. Is the treatment with dogs mainly geared towards cheering up the person or bigger goals are aimed for? They are 2 main kinds of Animal Assisted Interventions; there is Animal Assisted Activities (AAA) and Animal Assisted Therapy (AAT). AAA tends to be more of a casual interaction whereby volunteers bring their pet dogs to bring joy and cheer to people in hospitals, elderly homes etc. On the other hand, AAT is a goal directed intervention administered by a trained health professional with the assistance of a trained therapy animal. AAT is part of the treatment plan and progress is clearly monitored. At Pawsibility, we focus mainly on mental health of our clients. One of whom is a 15 year old girl with selective mutism and social anxiety. She doesn't make eye contact with others and barely speaks in school. She really likes working with my therapy dog, Telly and is all smiles when she is interacting with Telly. Having Telly lean on her lap as she pats her, helps her to be more calm and relaxed. One of her favourite things is to get Telly to do tricks. To do so, she needs to speak up to give Telly the command. As she gave Telly the commands, and watched Telly respond to her, she gradually grew more confident. We managed to practice having conversations about Telly and then about other topics. Subsequently, she started speaking up in school, starting with one word, then a phrase and now she can speak a few sentences with a few people in school. Her parents are very happy at the remarkable improvement they have seen in their daughter and the school counsellor also noticed the positive changes. Another example would be an 11 year old boy, who is high functioning on the autism spectrum. He struggles with managing his emotions and tends to have anger outbursts where he would hit/kick others in school. He absolutely adores Telly; he is patient and kind around Telly and he has never lost his temper with Telly. We saw a different side of him appear, and we helped him to see that he is capable of being that way around his peers in school as well. In working with Telly, he has learned to have empathy and put himself in the shoes of others. He is always thinking about how Telly is feeling and how his actions impact her. I recall once when we brought Telly out for a walk, we met a dog who started barking fiercely at Telly and Telly chose to ignore the dog and did not bark back. He drew a few lessons from that incident; firstly that others tend to avoid us when we are having an anger outburst and secondly, that we do not have to react negatively even when our friends annoy us. He wants to be kind and patient, just like Telly. He learned to put those skills into practice at school and at home as well. He learned to manage his anger better and has significantly fewer incidences of outbursts. What training is entailed for a therapy dog? Firstly, we need to select the right dog for the right job. We typically look for dogs that are confident and have a friendly temperament. Dogs are then trained with basic obedience skills as well as some specific skills that they may need to use during the therapy sessions. For example, the therapy dog may need to retrieve objects for their clients during a session, or be in a certain position accessible for a person on a wheelchair to pat. In the event of a client meltdown, the dog is trained to stay calm and safe. The dog need to be reliable, predictable and should enjoy interacting with many different people in different settings. Lots of positive socialization for the dog is helpful. It's important that the dog enjoys the work and not just merely tolerates it. More than simply training for the therapy dog, it is equally important that the human half of the team (dog handler/health professional) is trained in animal assisted therapy. This is so that they can facilitate the session and bring out the best in the dog. It's critical that the handler knows the dog well and is constantly watching out for any stress signs that the dog may exhibit and is ready to intervene at any time. Is it the natural friendliness of the canine which helps make the patient comfortable, or is the dog specifically geared to behave in a particular way? I think it is a bit of both. The moment my office door opens, Telly would run over to greet my clients with a wagging tail and a big smile on her face. Sometimes, she would even bring a toy for my clients. That is a very natural behaviour for her and it is part of her friendly personality. However, I did teach her to have good manners e.g., not to jump on people, to sit politely for greeting, etc. Her warm, friendly presence helps to put people at ease and many of my clients tell me that she makes them feel happy. Dogs tend to be accepting and non-judgemental and that is a message that comes across quite clearly to the people that they interact with. Is the same dog used to address different issues or different dogs have to be brought in for various problems? That depends. Different dogs like to do different things. I have two dogs with different personalities and strengths. Telly is very playful and is a perfect animal assisted play therapy dog; she lives by the mantra "What shall we play next? What can I do to please you?" My other dog, Hope, wants to cuddle up in your lap to get endless pats; she would be great for some of my counselling clients who just want to talk and pat a dog while doing so. Some dogs prefer working with children, others prefer adults. Different people also respond differently to different dogs (size, energy level, breed etc). Another factor to consider is the training of the dog and handler. It is about finding the right fit for all parties involved. See Telly in action in this video here. Is the dog ever left alone with the patient or is there always a supervisor around? The dog is never left alone with the patient, all visits are supervised. Firstly, this ensures safety for both patient and dog, secondly, AAT is different from just an interaction with a pet dog, it is intended to be a facilitated session run by a professional to help the patient meet his/her treatment goals. What are the other animals used in animal assisted therapies? Typically, domestic animal who enjoys interaction with people could be good partners for AAT. Examples include horses, cats, guinea pigs, etc. No. For AAT to work, the patient must enjoy/be motivated by the interaction with the animal. If the patient is not interested in interacting with the animal, this would not be an ideal intervention for him/her. What made you start Pawsibility? I have seen first-hand how animals are able to help people - how people with disabilities are more confident on horseback, how people who are not motivated for physiotherapy would push themselves a bit more to raise their hands to throw a ball for a therapy dog to fetch, how people with anxiety relax in the presence of a friendly therapy dog, how people who find it hard to talk to a counsellor/psychologist would talk to one with a therapy dog present etc. I believe in the power of the human-animal bond to touch lives, teach skills and inspire change. While people in the United States or in Europe have access to AAT, very few people in Asia have even heard of it. 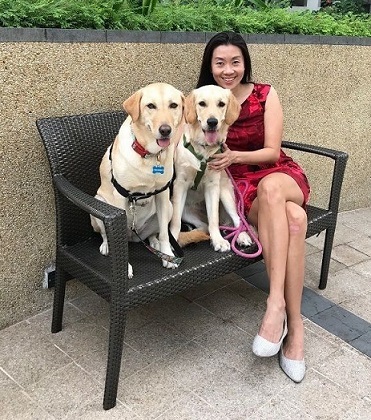 I started Pawsibility with the hopes of helping people in Singapore to also benefit from this wonderful intervention. Don't miss the video below. You can connect here to Pawsibility or leave us a comment at the end of this article. Are We as a Community Failing Special Needs Families?